San Quentin may finally do some good. 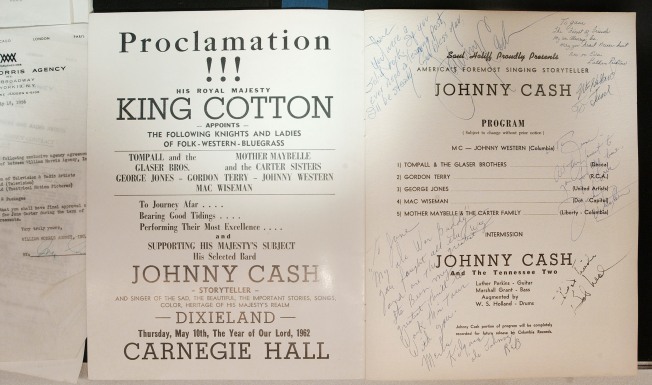 Johnny Cash sure as hell wouldn't pay $5,000 for anything to do with San Quentin but that probably won't stop his fans from dropping a few bills for a piece of history. Some of the iconic man in black's gear is hitting the auction block, including his famous blue jumpsuit that he wore during his classic performance at San Quentin Federal Penitentiary. Along with his jumpsuit, his trust is expected to auction off some of his guitars, a harmonica, his passport, a briefcase and pages of his handwritten notes and lyrics. Julien's Auctions in Los Angeles will display the items before putting them up for sale on Dec. 5. Bids will be solicited online through JuliensLive.com. A portion of the proceeds will go towards MusiCares. Visit the auction's website for a full list of items.